The OS-5020P oscilloscope is state of the art in design and has been human engineered for easy operation. These features alone make this new compact analog oscilloscope a model for the future, but theres more. 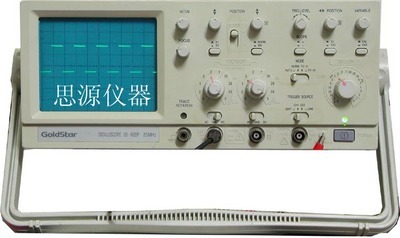 This 20MHz scope also has two channel input, dual trace output and high sensitivity triggering. This scope comes equipped with a newly designed 6" CRT that is brighter for easier viewing and allows for a more precise measurement. The OS-5020P is designed for use in manufacturing, service, education and for the home hobbyist. Its many applications include: testing, service, troubleshooting and circuitry design. Deflection Factor 5mV/div to 5V/div in 10 calibrated steps of a 1-2-5 sequence. Time Base 0.2us/div to 0.2S/div in 19 calibrated steps, 1-2-5 sequence.